DescriptionTravel Sytem Graco Evo, for new-borns and infants. One-click system to fit seat on the stroller. At the back of the car, with 3 points car seat belts or on its in-car base. On the right front seat: make sure airbag is not activated. Level indicator to make sure of the seat correct installation on its base. Suitable from birth till 13 kgs (about 12 months). With its leightweight chassis and its Graco Junior Baby car seat, the Graco Evo travel system is easy to use: one clic to lock it on the pram, few minutes to install it from the pram to carseat installation. 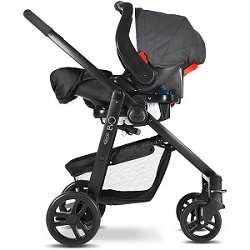 With its compact folding, this pram is perfect for city walks in Paris. Gabriela (new born pram hire in Paris): "This service is fantastic , they dropped off the pram at our hotel and picked it up from the airport. I didn't know a service like this exsist until I googled it and it was perfect exactly what I needed. Travelling with an infant is hard and the thought of having to bring our big pram all the way from Australia was hard. Communicating with them was easy they responded Promptly and with ease. I couldn't recommend this company and service more highly. Thank you !!! Sabrina (Graco Evo stroller and Graco Junior Baby car seat in Paris): "Excellent product and service! The stoller we rented was as expected and invaluable in our stay. Communication with staff was excellent. I would definitely recommend and use again. Thanks for making our stay in Paris better!"